← Days 231, 232 and 233 – RTTY! Some time ago I decided that I really ought to have a dummy load in the shack. I used to own a very good BNOS load a long time ago but I really have no idea what happened to it. At some time it probably was either sold or stashed in the loft, I really can’t remember. So anyway, a week or so ago I started looking into building myself a dummy load. I knew what I wanted, the ability to handle up to a couple of hundred watts and to work up to 50MHz and perhaps 144MHz although the latter wasn’t really important. 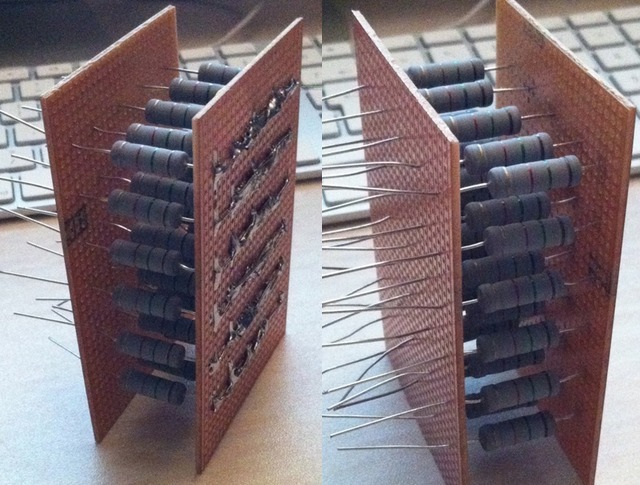 The first thing one needs is to decide what resistors to use, rating and type. I knew that I wanted non inductive resistors but couldn’t find any highly rated ones at a sensible price. I did discover some on eBay but once I’d emailed to check the part number I realised that they were inductive and therefore not suitable. I ended up selecting these metal oxide resistors from Rapid Online and picked up thirty of them to solder in parallel to give me the required 50 ohms. 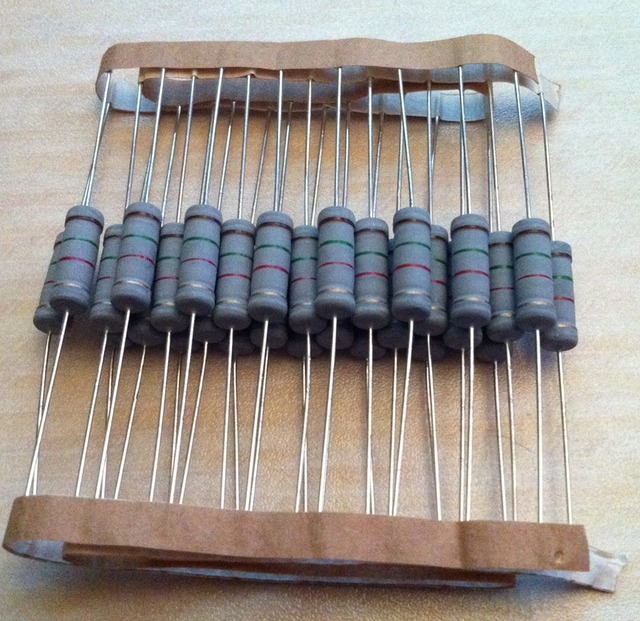 I couldn’t find out any details about the TruOhm range but I figured they’d be OK – The wide spiral cut into metal oxide resistors don’t usually offer much inductance. At worst, it’ll work on HF and be useless on VHF. I bought a paint tin to build the dummy load into. Have you any idea how difficult it is to buy an empty paint tin? Nowhere local I went to keeps them in stock, not even B&Q because although they mix paints, the tins come with the base colour pre-installed. So it was eBay that I went to where I found this seller who has lots of different sized tins. I worked out that a 1 litre tin would be ideal for the project. I also picked up a couple of chasis mount SO-239 sockets on eBay which I bought and I’d decided to solder the resistors to a couple of brass plates so I bought a sheet of thin brass which was nice and cheap. Finding the oil to fill the can with caused me a problem – All the sites I found suggested “mineral oil” and I determined that it’s known as “liquid paraffin” in the UK. I could find plenty of places that sold it but would charge me far too much for delivery. I called a couple of local vets and one only had a small quantity and the other wouldn’t sell me any without a prescription. Crazy. In the end I found a supplier who didn’t charge for delivery and although the price for the oil itself was higher than anywhere else, it still worked out the cheapest. So with everything here I started work. I first cut a hole in the lid of the tin and fitted the SO-239 socket, making sure the inside was soldered to prevent oil seepage. That doesn’t photograph too well but it’s actually a solid joint both mechanically and electrically. 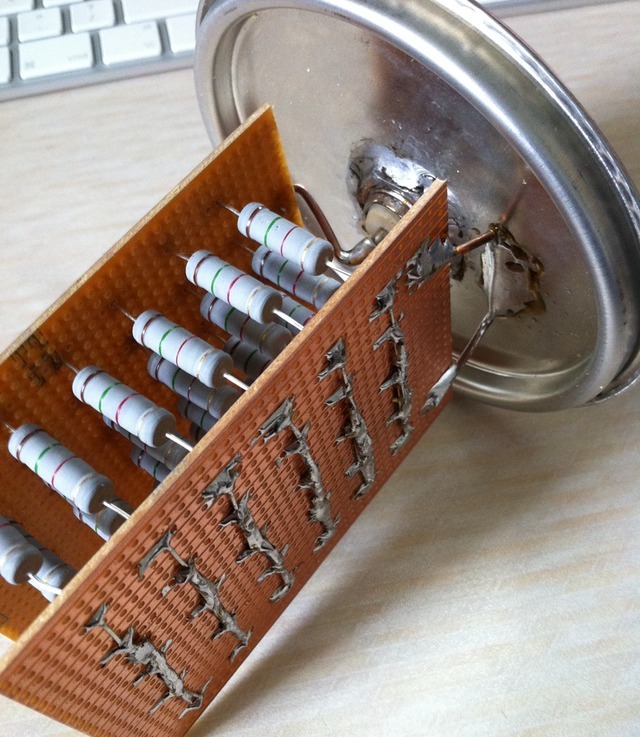 The next thing was to sort out the brass plates – I cut them to size, taped the two together and drilled thirty holes in each plate for the resistors but it soon became clear when I came to solder them that I’d made a mistake. The plates were so thin that it only took a few seconds with the soldering iron for them to become too hot to handle. I’d have to rethink this. I ended up with two pieces of stripboard and used those to mount the resistors, I fed them through a row at a time, soldering as I went and soon I had this. 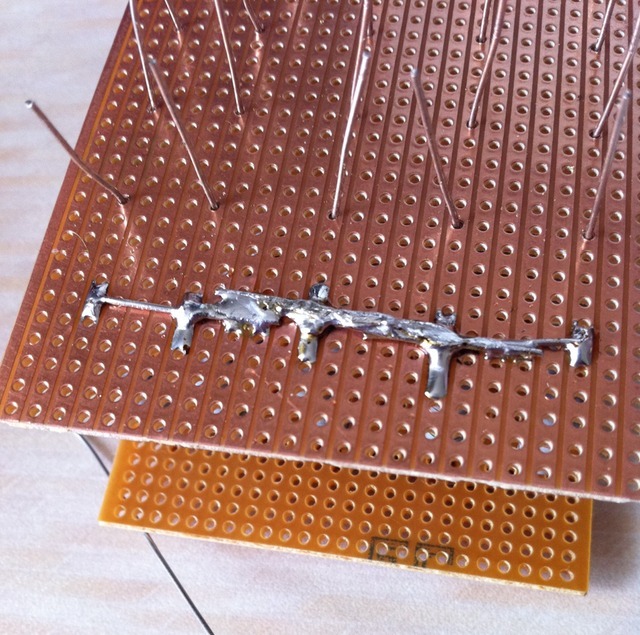 The next thing was to solder the second side – I’ve taken a closeup of how I did this and it was pretty simple. Originally I was going to trim and solder as usual and then bridge the tracks afterwards but folding the legs over and linking them all together seemed the sensible thing to do. 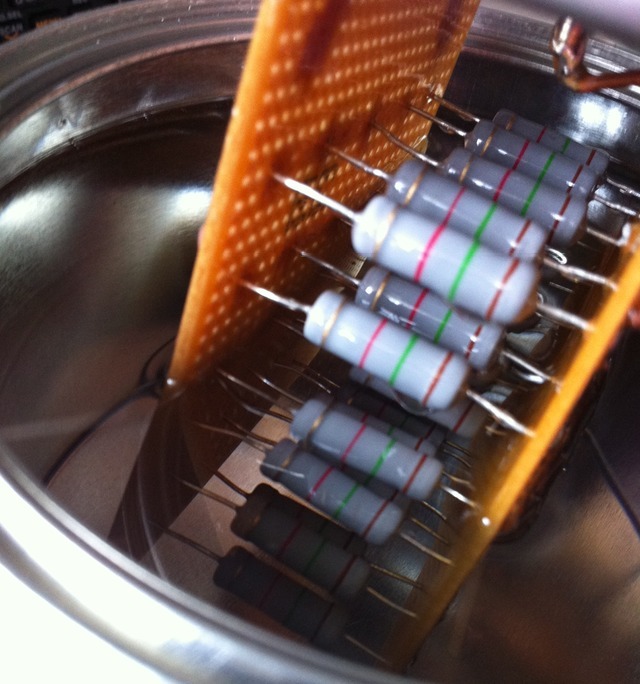 I deliberately used plenty of solder – The more metal attached to the resistors, the bigger effective heatsink means more power dissipation. When everything was done, I fixed the completed load module to the SO-239 with two very thick lengths of copper wire bent and shaped as brackets. All done and time to test. Can’t argue with that, it’s what I’d expected it to be so the next thing was RF. I connected my radio and gradually increased both the power and frequency and ended up on 6m running 90 watts. 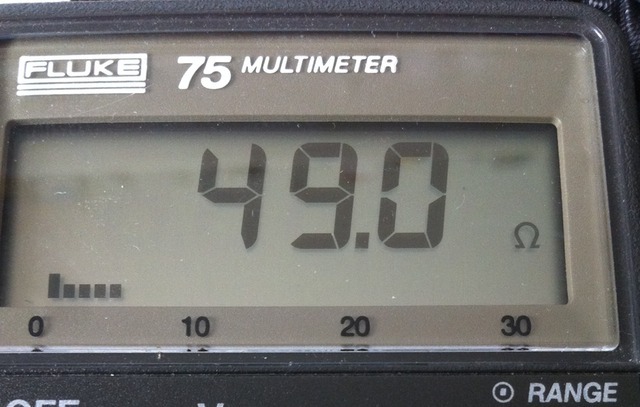 Here’s the meter reading at that frequency and power. 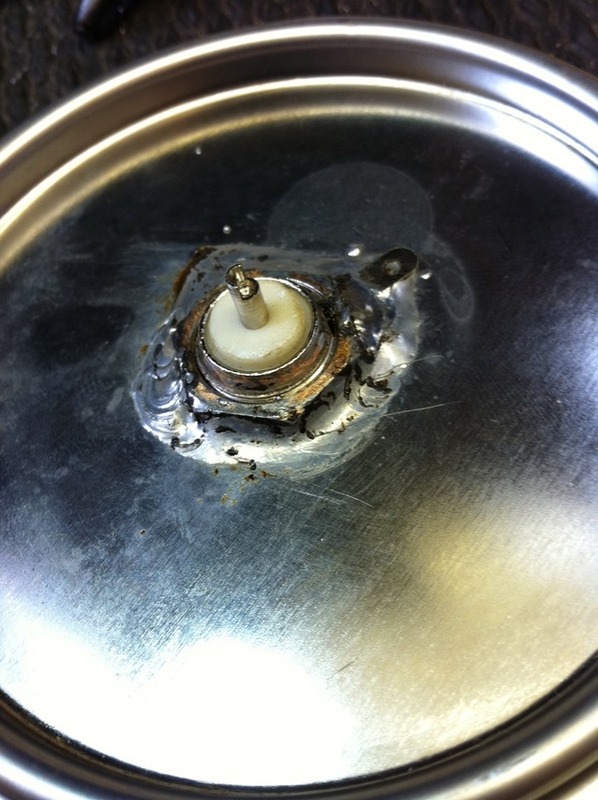 All that remained was to fill the can with oil and close it all up. I used 30 x 3 watt resistors giving a total of 90 watts power handling in air and that’s why I tested at 90 watts as shown above but sinking in oil makes a big difference. I’ve tested running 100 watts into the load for a couple of minutes and the oil temperature doesn’t feel as though it’s changed at all but the resistors are a lot cooler than when running much lower power in air. I don’t know what the exact power handling capabilities of this load are but it’s enough for me. It doesn’t work so well on VHF though as there’s probably too much inductance introduced through the stripboard and the long resistor legs but as it was wanted for HF operation, this isn’t a problem. Not bad at all. If I build another then I’ll reduce the costs by sourcing the oil differently but even so, that’s a good price for a decent HF dummy load. I’ve now tested my homebrew dummy load using my analyser – To read about the performance, please read the blog entry here. 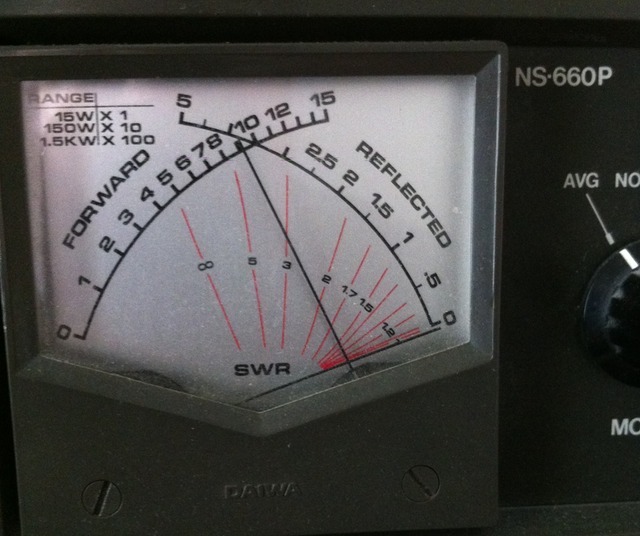 This entry was posted in Amateur radio, Construction and tagged Dummy load, homebrew. Bookmark the permalink. Interested in article. I would like to build one myself. Just found website storo.co.uk. This company apparently sells tins! As far as I know normal transformer oil can also be used, being a heat transfer oil. And it might be a lot cheaper and more easely available. Welding supply shops for instance. I’ve been trying for years to get hold of transformer oil. Whenever I see a bunch of electricity guys working at substations, I stop and ask them for some, only to get a blank look in return. What the author doesn’t say is that the Resistors are rated at 3 Watts to obtain the 90 watts he achieved (that’s without immersing in oil) By using any Oil this will increase the input power by double if not more for a reasonable key down time. I’m late to the game, but hopefully this will help anyone who’s looking to build one of these. Here in the U.S. we can frequently find empty (new) paint cans at Ace Hardware much easier than the big box stores. Perhaps a similar “mom and pop” shop in your area would also carry them. They’re often used by woodworkers who mix their own varnish or stains. The mineral oil can be substituted with common off-the-shelf Baby Oil (such as Johnson & Johnson’s here in the States, but I believe it’s an international brand). At any rate, common baby oil is nothing more than scented mineral oil, and can be used in this project with no ill-effects.